As a child I was brought up in church and taught Christian values. These valuable lessons would prove useful later in my life as I looked for a way out of a bad situation I was in due to bad decisions that I had made. Questioning my self-worth as a child I turned away from the church trying to find a place to fit in. Not realizing the extent of how much I did not know at the age of 12 I started to get lost in the world of drugs and alcohol. My addictions became stronger as I got older and experienced a life where not all things worked the way that I hoped they would. While my addictions went from drinking beer and smoking marijuana to smoking crack and drinking anything available, a place to fit in became more of a place of isolation for me as I no longer felt comfortable being around most family members if I had something stronger than just a few beers. This was in most cases when I would get high with other addicts or alone because for me a drink was always better with crack. Finally after 30 years of addiction on June 6, 2006 I hit my rock bottom, but I remembered what I had learned as a child about a power above all other powers. I prayed to the highest power and God my Father in Heaven made a way for me to get into a drug and alcohol treatment program. 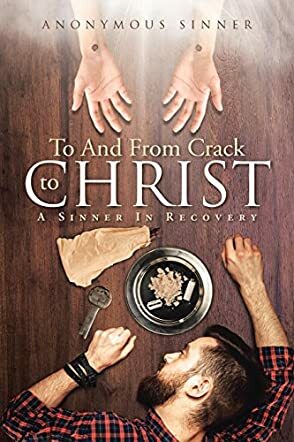 The author of To And From Crack To Christ: A Sinner In Recovery calls himself Anonymous Sinner and doesn’t mince his words. Starting from age 12, even though he was brought up with Christian values, a lack of self-worth and family issues and problems found him experimenting with drugs and alcohol, ending up in a downward spiral until the age of 42. The problem with drugs and any other kind of addiction is that there is always a willing participant to share the experience and it’s easy to get high and drunk together. Like most addicts, the author gradually drew apart from his family, feeling uncomfortable. Like most addicts, the only person who can say no is the addict themselves, and the decision lies with them to stop the drugs or alcohol. That decision takes total honesty, a baring of the soul, and a complete acceptance that the power lies within their hands. For the addict who has a grounding in scripture, the task might be easier. The addict needs to replace the perceived lack of self-love and self-worth with real self-love and a perception of self-worth. This can come through the word of God and realizing that God’s love is unconditional and complete. The author turned to God in heartfelt prayer and God answered him, helping him to enter a program of recovery. As the author himself says, God works in mysterious ways. The author speaks and writes from the heart, telling his incredibly sad story with honesty in a simple yet moving way and including many scriptures. Anyone who has either been an addict or had a person close to them suffer from addiction will relate to this story. Sadly, it is a story that is so common, so familiar, and taking the next step to yet another form of addiction becomes easier and easier. The person watching a loved one spiral down into hell is helpless to intervene. The author has a personal viewpoint that might seem contentious to readers, but this is something that has worked for him. Although he used the 12-step program to start on the path to healing, he believes that man-made programs do not work as well as a God-made program works. He calls himself a 'sinner in recovery' and urges readers to consider going higher than a 12-step program to a God Step program, the one that has helped him on the path to redemption. The answer lies in the study of God’s word: “If we would take it upon ourselves to study His word, we would see that there's hope for us all even though we remain sinners in recovery.” This is a revealing read for anyone interested in the mindset of an addict, the social problems that lead to addiction, and what can be done about helping those who have a genuine desire to give up their addiction. The author includes his own heartfelt poetry to share with readers and has created a website to help those who wish to recover but remain anonymous. It was inspiring to go into the mindset of an addict as he came out of a hole that he had dug himself into deeper over the years. Through prayers and faith he never gave up in some of his darkest times and God answered his prayers and showed him a way out of his despair. However Anonymous had to use his own free will to decide rather or not to fight his demons himself or turn them over to Christ. Fortunately for Anonymous, the Lord heard his cry, saw his sincerity and made a way out of no way.